Over the years, we’ve learned to adapt our process to the needs of each of our customers and their homes. After all, each of our customers has different preferences and needs, and different homes require tailored insulation solutions to accommodate their age, building materials, structure, and more. To get started on insulating your existing residence, our team will come make an assessment of your home. We find that many homeowners are surprised by just how much a small change can impact their energy efficiency and their comfort. Once we have determined the best home insulation solution for your existing residence, we will begin the installation. This could entail a couple of scenarios because we offer a variety of insulating options, which we will detail below. Our home insulation services include attic insulation, existing exterior wall insulation, garage ceiling insulation, and crawl space insulation. Each of these areas plays an important role in the thermal boundary of your home, and leaving any one of them without insulation leaves you open to less temperature control and more outside noise. Attics are sometimes left unfinished or they’re used for storage, leaving little room for adequate insulation. 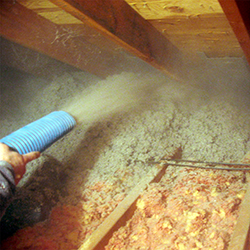 Thankfully, insulating an attic is relatively easy with blow-in insulation and will greatly affect your home utilities. Click here to learn more. Exterior walls left uninsulated will allow for greater outside noise from roadways, neighbors, and more. 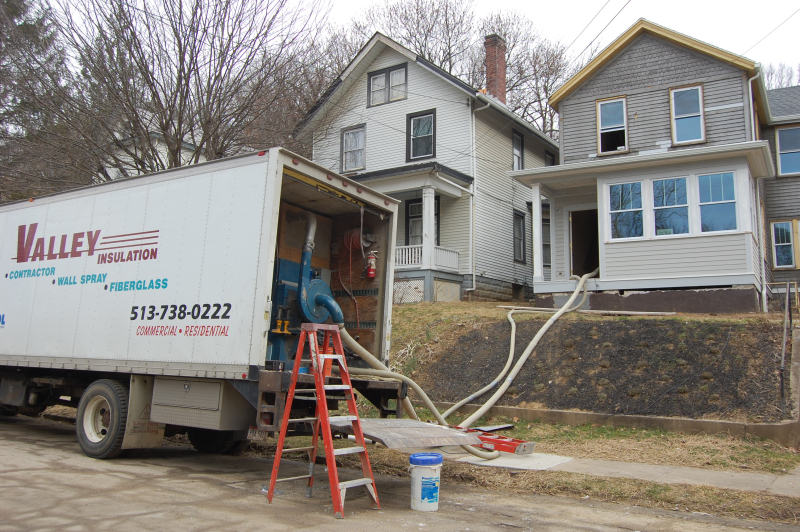 For exterior wall insulation, we often recommend the “drill and blow” method. With this simple method, we put a small hole in your wall and fit a hose to it, which allows us to blow in cellulose insulation without having to remove the existing wall. Click here to learn more. Home insulation for the garage ceiling is great for people who have rooms above their garage. These rooms are often more difficult to heat and cool if the garage ceiling has not been insulated. They receive a lot of noise from cars and the garage door as well. Insulating these rooms will help reduce noise and improve energy efficiency. Because garages often store volatile chemicals like spare gas and paints, insulating them can help prevent or slow the spread of fires to additional parts of your home. Crawl spaces are often damp, and some may flood. Because they are often near moisture, we may recommend a moisture barrier on the ground to stop moisture from getting into the house. Then we have two different methods to insulate – the mesh and blow system or fiberglass batt. Click here to learn more. With over 40 years of experience providing home insulation in the Greater Cincinnati Ohio area, we understand the regional climate and how to best improve your home’s energy efficiency. Call today to let us provide your home insulation. Reach us at 513.353.4100 to get started.